For the last three years, I've been lucky enough to work with Ian's art teacher and students on a collaborative project. There is a theme each year for the school, and the art projects loosely revolve around that theme. 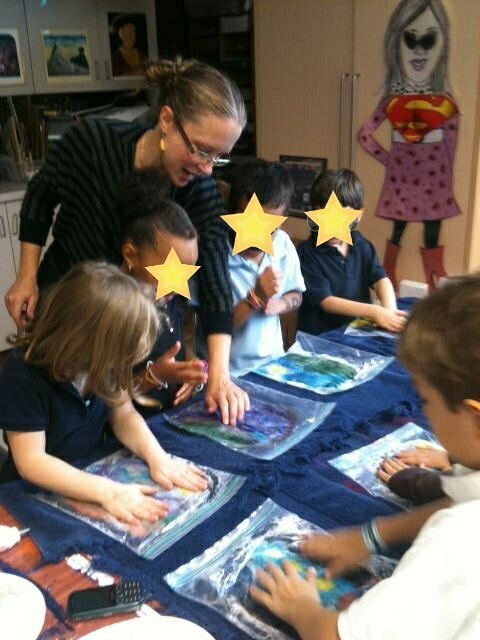 Ideally, each classroom has an adult "guest artist" volunteer that comes in to facilitate an art experience for the students. 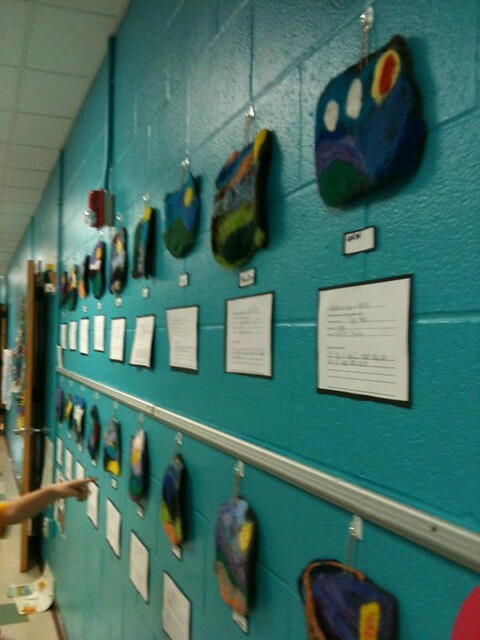 The finished pieces are displayed around the school and an Art Show and fundraiser is held one night each year. When Ian was in Kindergarten, a friend volunteered me for the "guest artist" position during another event Ian's class was having in the art room. Prior to that, I'd thought myself crafty, but not an "artist". But was I? I'm still trying to figure that one out, but the process of creating with these 5 and 6 year old kids transformed me creatively, no doubt about that! 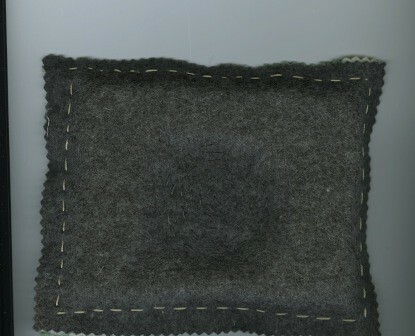 So far, my favorite project has been felted wool landscapes. 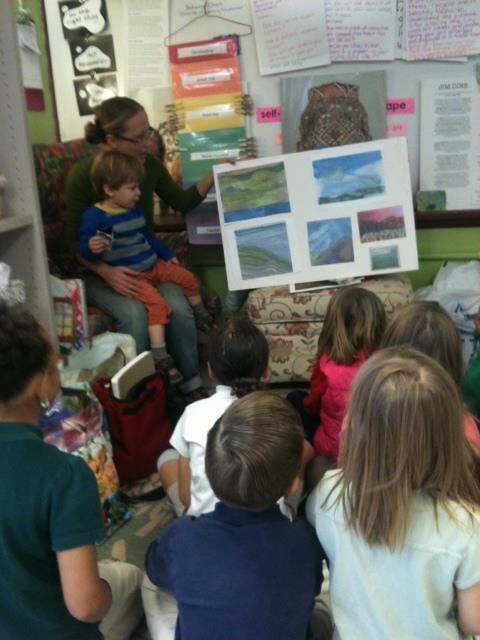 The students had already studied landscapes in class, and were familiar with the concept. I brought in a poster board with pictures of examples of fiber art landscapes for the first class meeting, you can see I have my faithful sidekick Silas with me! 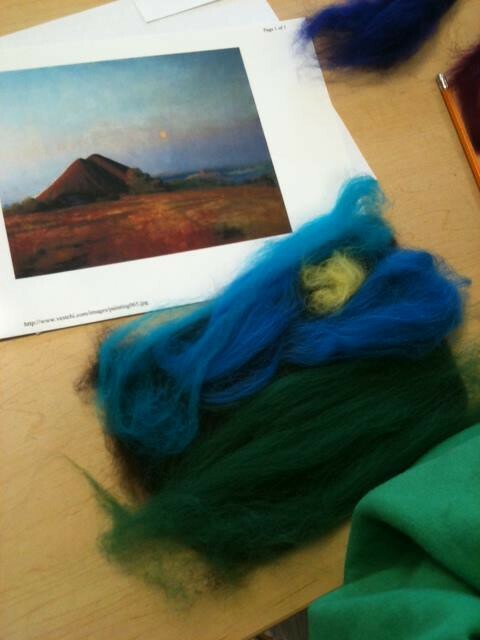 Ian's teacher, Camilla, already had multiple examples of abstract landscapes printed out, and we put gorgeous piles of fluffy wool roving at each table as well. It's a bit tricky to see, and I don't have another photo to show, but before the class meeting I lightly needle felted natural brown wool rectangles, one for each student. 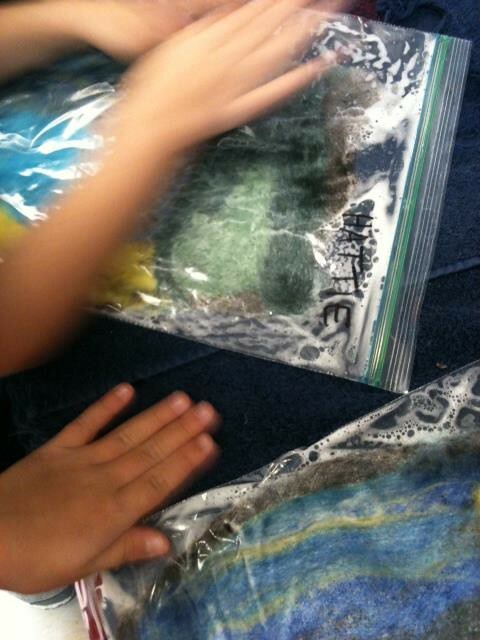 These were their "canvasses" for their abstract landscapes. Here I'm showing a few students how to pull the fibers apart. There are so many reasons to love this project, the wool is such a wonderful material. It is soft, colorful, can be easily manipulated, doesn't make a mess, and until felting, children can change their canvasses if they wish. 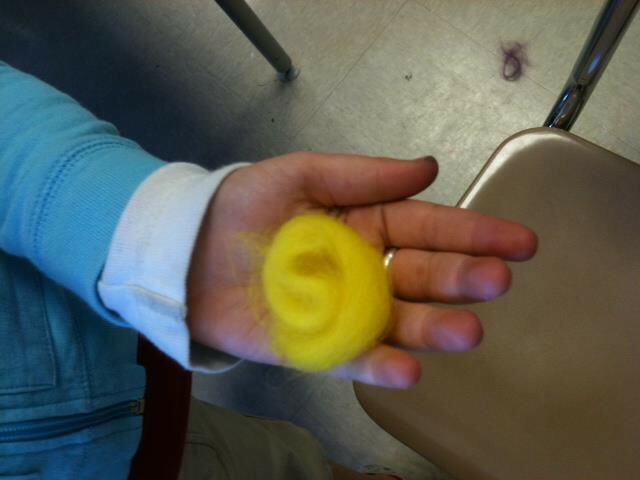 After the students were done placing the wool on their canvas, I took each piece home and lightly needle felted the top. 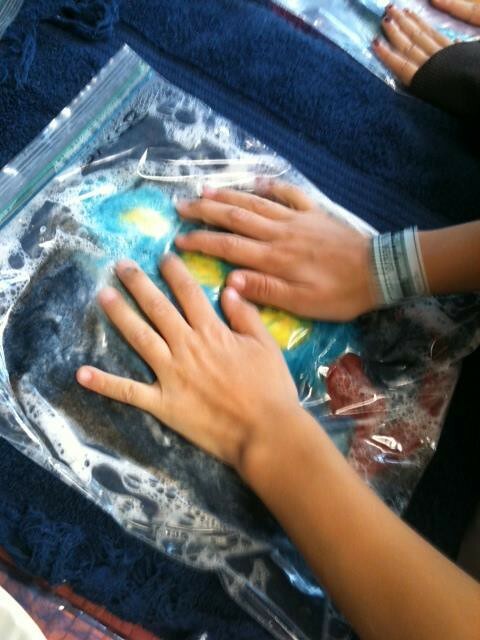 This helped to keep the fibers in place for the next part of the process, the wet felting! Voila! After about five minutes of felting inside the plastic bags, I took the bags home and rinsed each landscape in as hot of water as I could stand to continue the felting process. 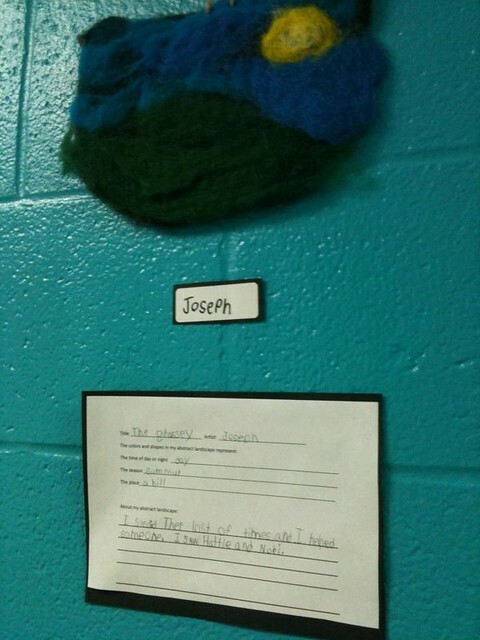 Almost all the wool roving stayed in place! 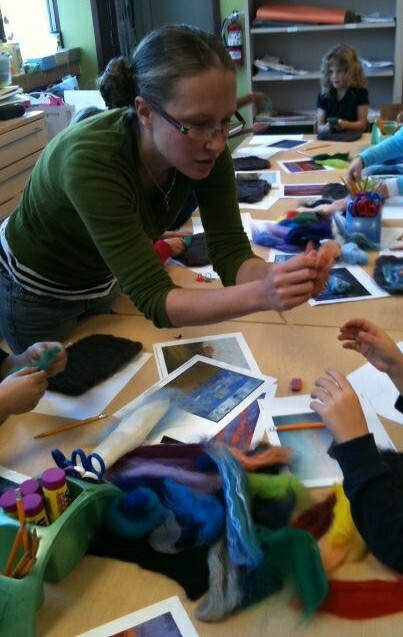 It was very important to me to preserve each artist's vision as much as possible during the felting. Here they are, hung on the wall! For hangers, I just threaded a piece of plain jute twine into a loop at the top of each piece. 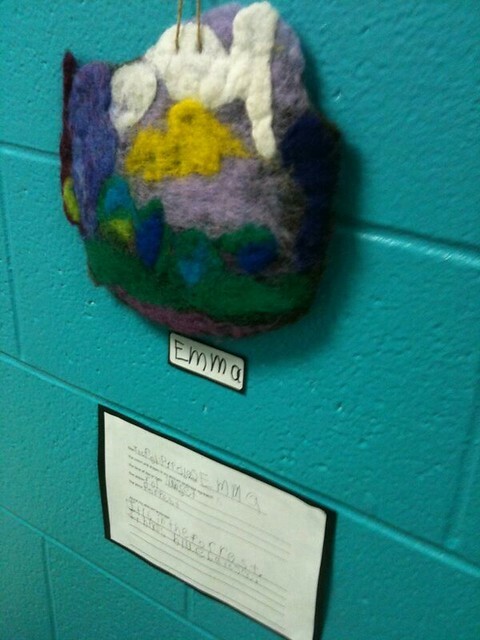 Jen, I can't wait to see pictures of the art show from Ben's school! Be sure to take lots of photos. Readers, have you participated in an art project or auction similar to this? I'd love to hear about it! I can't believe how this year is flying so far. 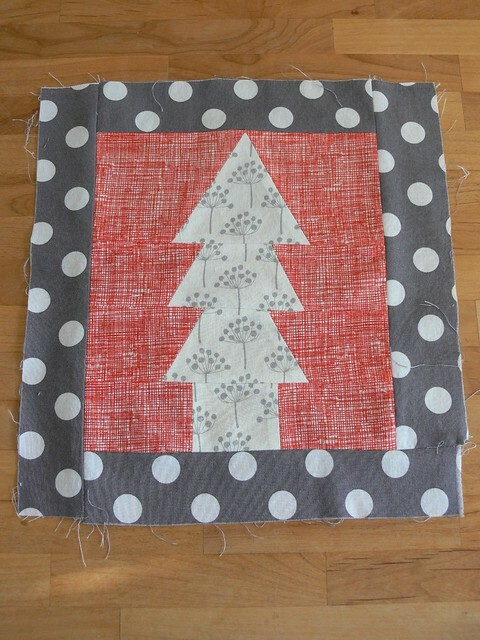 I owe you an update on the crafty front! I have been so busy with my little business, which is great. I feel like things have finally kicked into a smooth, steady gear. I have had a constant stream of projects to work on, mostly custom orders. (See below for a few examples!) But eek, it's hard to stay afloat on all fronts and I feel like my blog posting has fallen by the wayside, along with my socializing. I'll try to catch you up here! 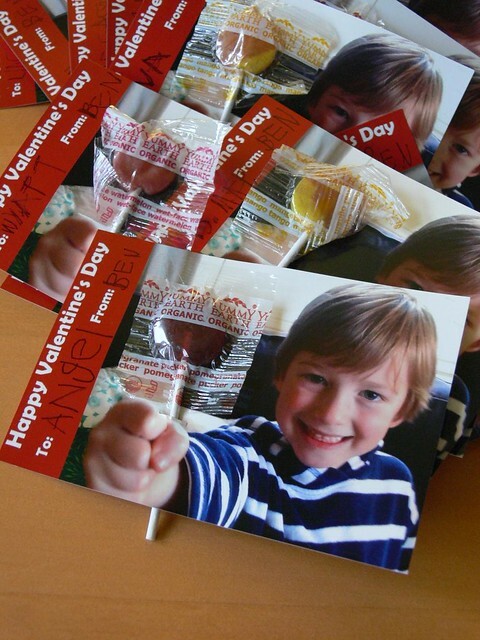 First, I wanted to show you the little Valentines I made with the kids for Valentine's Day last week. 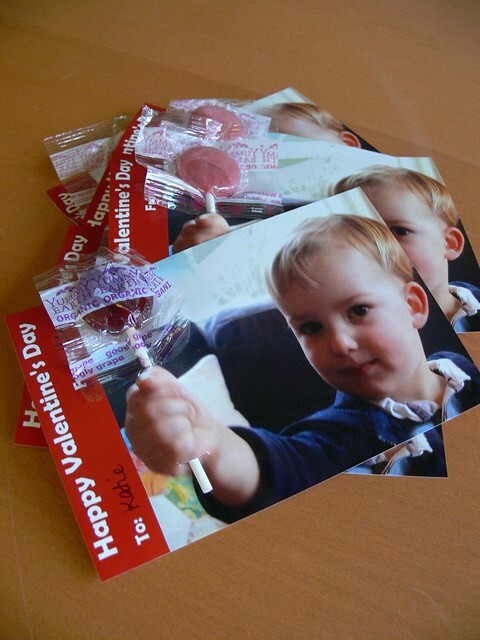 I had noticed this adorable lollipop-holding photo idea on Design Mom a while back and pinned it. The weather was horribly rainy and gloomy in the days leading up to V-day, so I had to take indoor photos of the kids, which of course were slightly blurry. They turned out pretty cute though, and were a big success with their friends! Ben has a little friend named Angel in his class! 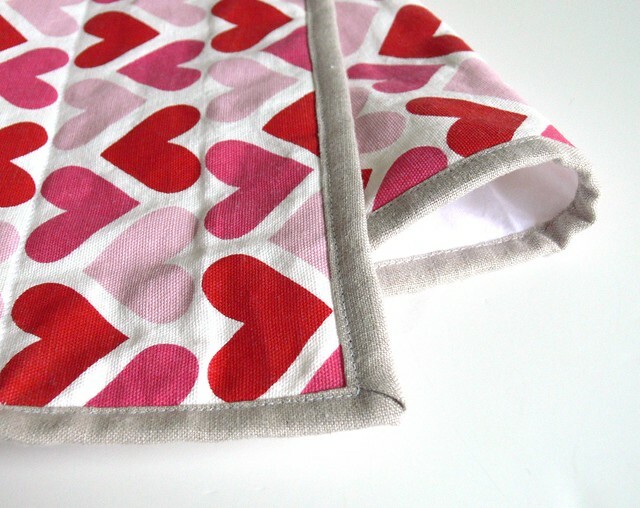 In the spirit of Valentine's Day, I also made some heart-y table runners for my shop. I love how these turned out, fun! 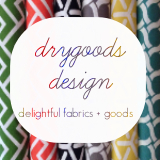 A few weeks ago, I scored a whole bunch of new fabrics from both Drygoods Design Online and Hawthorne Threads. Here are some photos to make you drool. There is some Stamped, some Bella, some Notting Hill, and more loveliness. 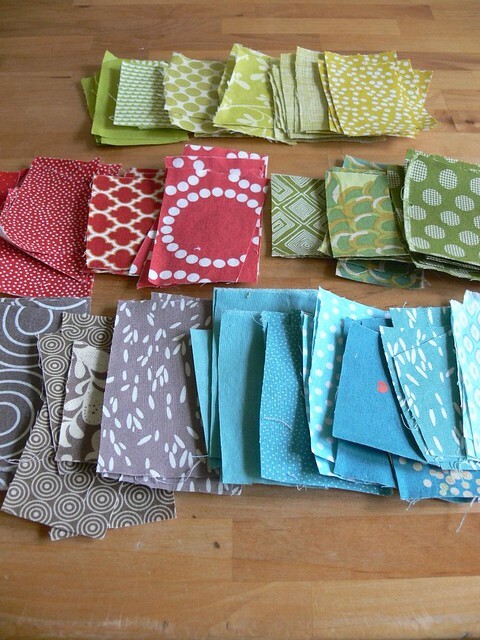 Pretty much all of this is going into projects for my shop, though I'm thinking of saving some of that Notting Hill sateen to make a pillow for our living room. Here are some of the custom orders I completed recently: a book cover for our friend Carrie's bible study tome, some quilted table runners, and a custom set of coasters. Also, I am in charge of the auction art project for Ben's kindergarten class. 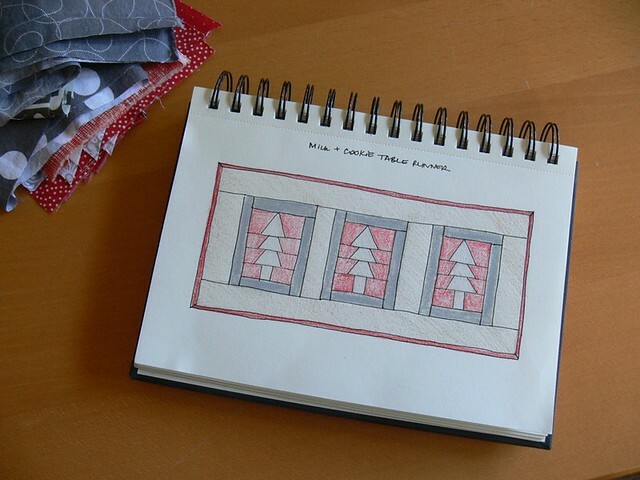 Their curriculum is project-based, and their winter project has been "Fabrics through the world". How fortunate! As you can imagine, I've been invited to do show and tell a couple of times. 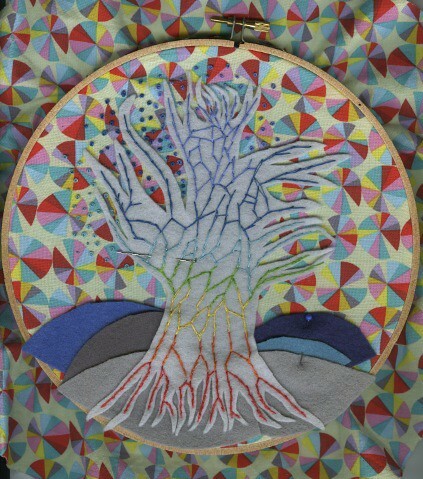 For the auction project, we've been working on a large piece of fiber art, involving fabric. 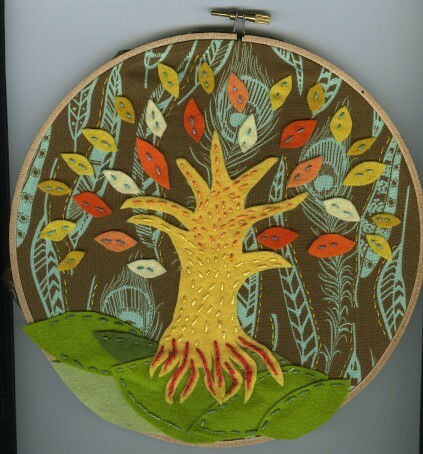 I had visions of branching out from my usual burlap art and doing something edgy and cool. 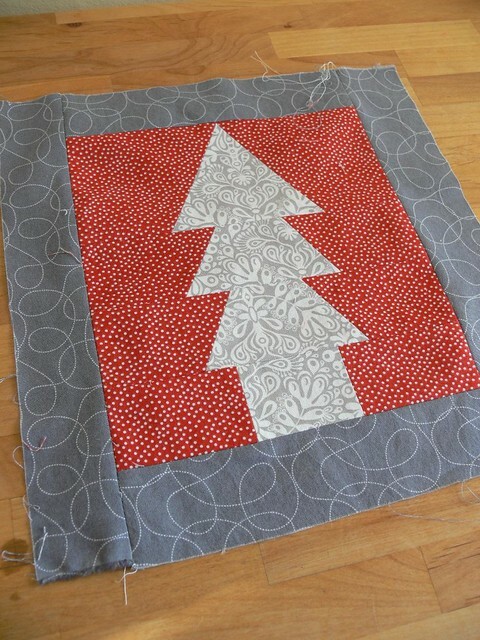 But all the feedback I received from the adults involved has been to stick to the type of stuff I've made from my shop, so the project will involve a tree and some birdies. Here's a glimpse at my prep work. I'll share more soon!! I think that about rounds up all that's been keeping me busy lately. How about you? What is occupying your hands lately? 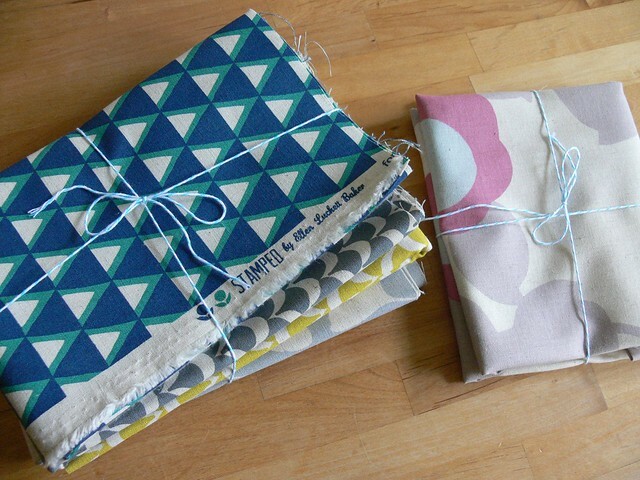 What fabrics are you drooling over? What projects are getting you excited? I'd love to know! Got together with my "Four Sisters" gardening group, it was the first time I'd met with them in many months. Thankful they held that space for me. We talked seeds, at night, without kids. Yes this is a big deal. 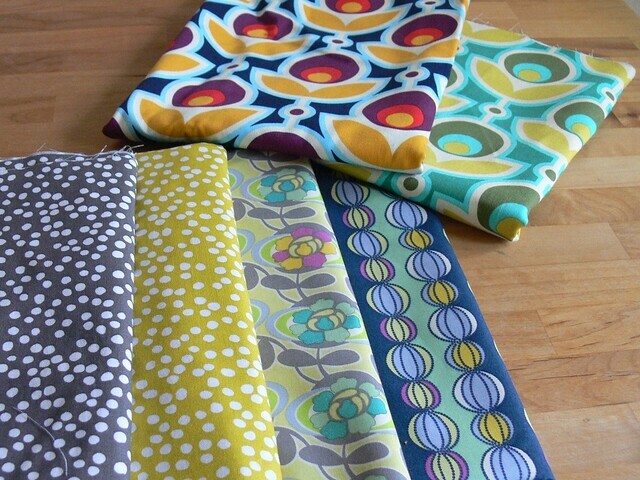 Changed the name of my shop to Angel Funk Designs, for simplicity's sake. Thanks Etsy for honoring that change. I hope to have some new items up for sale soon, fingers crossed. Ran errands, by myself, in my own car. Came home to an empty and quiet house. Thankful for a husband that helps me find that time alone, I am realizing lately how important it is to my sanity. I bought chicken feed at Green Wagon (tell Kev I finally have a local spot for organic feed!) along with a Happy Dragon candle and bar of soap from local company Alchemy of Sol. I wish you guys could come visit this year, you wouldn't believe how much this neighborhood has changed! I can't even find a parking space on the weekend to go to the hardware store. 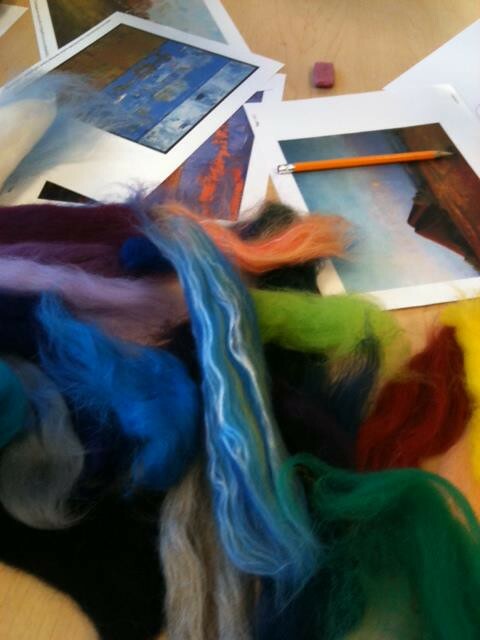 Contemplated, and then talked myself out of, this Needle Felting sculpture class at Arrowmont in June. I would love to go, the artists' work (Stephanie Metz) is amazing! But things are not really coming together in terms of planning and there's that little issue of paying for it, and that's ok. Something else will present itself at the right time, I just know it! One thousand apologies for my absence, but let's get on with it shall we? 2013 has been very creative for me so far, and I'd love to share a few of my latest projects. This little fox is the result of a lot of sketching and thinking, more on him later! I'll have a separate post, soon. I'm not quite done with this one, Ian asked to keep it at our house. 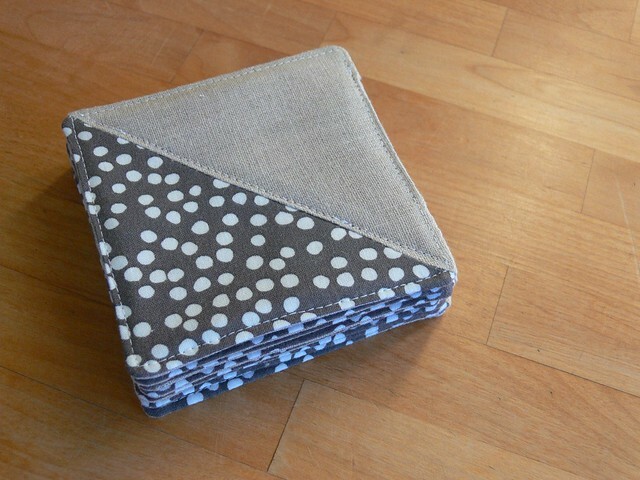 And, last but not least, I made a ton of these little fabric and felt catchalls for Christmas gifts. 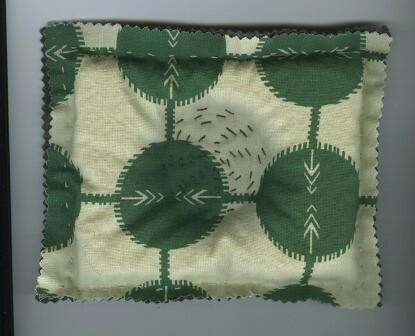 A piece of 100% wool felt, a nice print fabric in the same size, some embroidery floss and some buckwheat hulls! They turned out pretty cute, if I do say so myself. The embroidery in the center creates a small indentation for keys, jewelery, etc. 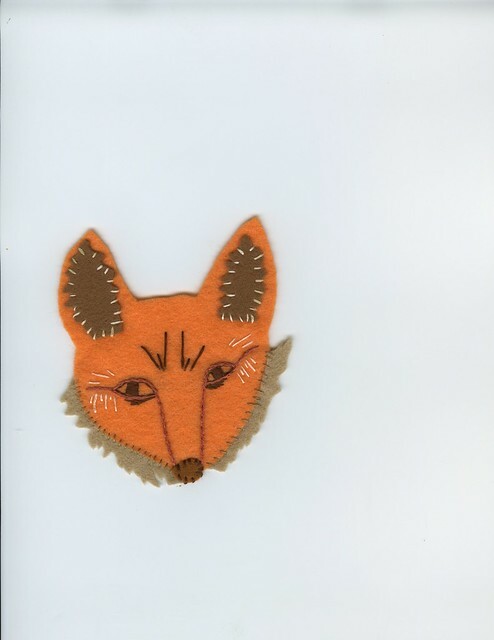 I hope to have some of these in my Etsy shop soon! 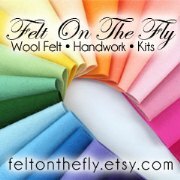 All the felt is from Janet at Felt on the Fly! 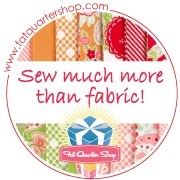 She's one of Stumbles and Stitches' sponsors, but I am also a loyal customer. Her felt is wonderful, her customer service is outstanding. Thanks again for picking out such beautiful colors for me, Janet! It's been a while since I've signed on, apologies. We're emerging from, oh, 6 or 7 weeks of sickness around here. It's been one thing after another, and at least one person in our family was sick at all times during the month of January. AAH! I know in the large scheme of things, I should be grateful that we're overall healthy and it was nothing serious. But it sucked, and I am knocking on wood that we are done! Since I've been home a lot with the kiddos, I've been trying to get organized, make lots of stuff for my shop, etc. I sorted through all my fabrics recently and gave a lot away, and then I re-organized what was left in my fabric cupboard. Take a look. Pretty! 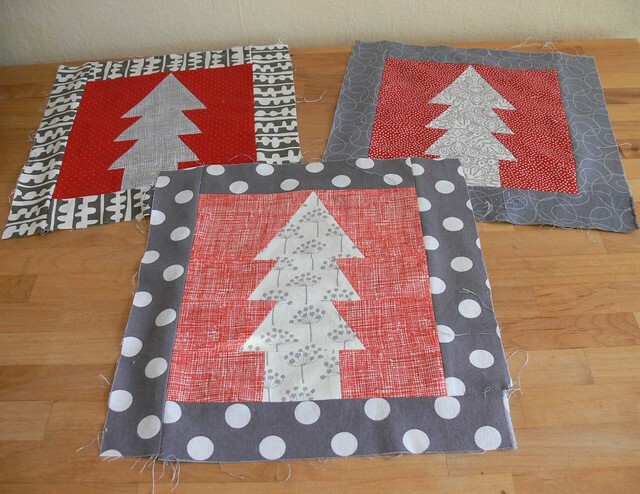 While going through my overflowing basket of works-in-progress, I found the following Christmas tree blocks I had made in November or early December. 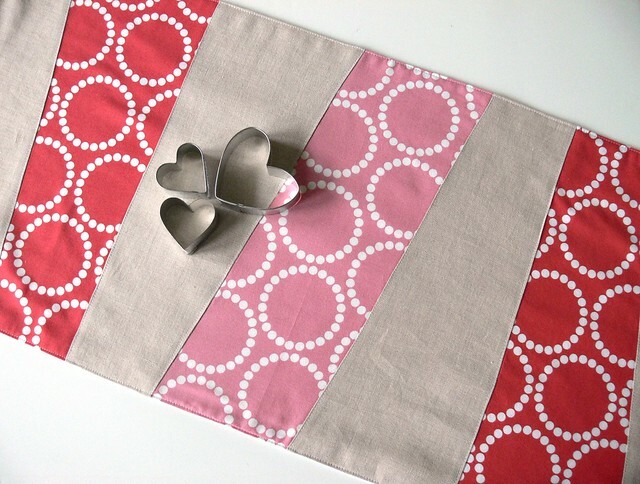 Remember this table runner I was planning on making? 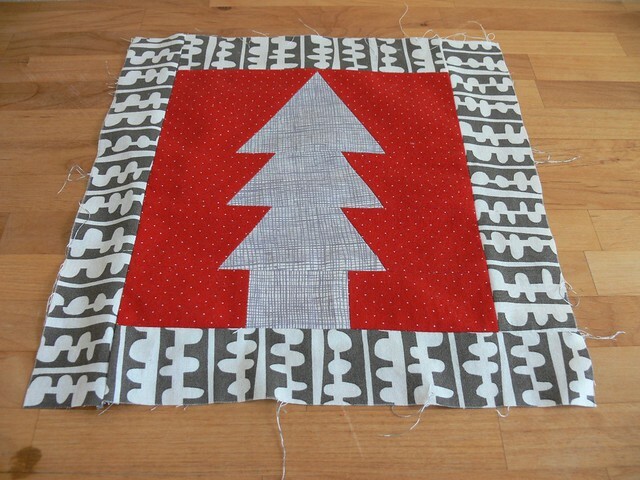 Clearly, I never did finish this table runner in time for the holidays. Bummer! Maybe it will be done by next year's Christmas. I like how the blocks turned out, each quite different, but they work well together. How is everyone? What have you been working on lately? I'd love to catch up in the comments.